The Honeydrippers, The Power Station, The Travelling Wilburys... so far in our look back at the ARIA charts of the late '80s and early '90s we've come across a number of supergroups of the rock variety. This week in 1990, a synthpop supergroup finally reached the singles top 50 with their debut release - a song that had come out overseas in December 1989. In fact, many of the songs to feature this week took their time reaching us in Australia. Yet another song with a long legacy spent its second week at number 1 this week in 1990. But Roxette's "It Must Have Been Love" - which, if you remember, was originally released back in 1987 in Sweden - would lose the top spot the following week to a song that was closing in fast. A belated top 100 entry for this hip-hop single that was first released in 1989 (in some countries as early as the start of that year). It'd take another year - and a quotable song with an answering machine hook - for Australia to get on board the De La Soul train. Next, a song that dates back even further - to October 1988, but this early single by The Stone Roses was also a flop first time around in the UK, and this ARIA chart run came following its re-release overseas. 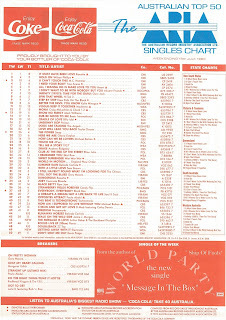 Australia had been the only country to get behind British band World Party's debut album, Private Revolution, sending it to number 13 and the single "Ship Of Fools" to number 4 in 1987. Second time around, there was less interest in Karl Wallinger's musical project, with this second single from Goodbye Jumbo the only track to make any impression on the top 100. We saw "Rok The Nation", the follow-up to "Got To Get", a few weeks back. And, after debuting on the top 100 back in mid-April, this European top 10 dance smash from late 1989 finally surged up the chart enough to register as a breaker for the Swedish duo of Robert "Rob" Wåtz and Rasmus "Raz" Lindwall, who were joined by rapper Leila K (real name: Laila El Khalifi) for their debut album. The hits continued in Europe for both Rob 'n' Raz and Leila K, who parted ways the following year, although Leila became better known for a couple of shocking incidents in her homeland. In 1996, she was accused of peeing on the floor at the Swedish Grammis after losing the Album Of The Year award. By 2003, it was reported that Leila was homeless, having spent what money she made on drugs, and stealing food to survive. "Do The Right Thing / Pump It Hottie" by Redhead Kingpin & The F.B.I. Here's another act that charted two songs outside the top 50 in 1990. We saw one, "Pump It Hottie", back in February - and that track was also included on the double A-side of this re-release of debut single "Do The Right Thing" (a UK top 20 hit in mid-1989). The reissue also came with a remix of "Do The Right Thing" by Soul II Soul's Jazzie B and producer Nellie Hooper, who incorporated elements of BBG's "Snappiness". Despite all that effort, Redhead Kingpin and his crew remained hit-less in Australia. 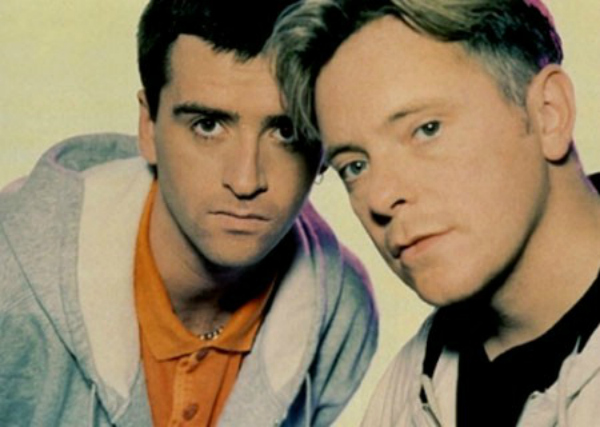 Comprising New Order frontman Bernard Sumner and ex-The Smiths guitarist Johnny Marr, with input on this first single from Pet Shop Boys singer Neil Tennant, Electronic was always destined to be my new favourite band, especially since their sound took its cue more from New Order and PSB than The Smiths (who I'd never really been that keen on). Released in the last few weeks of 1989 in the UK, "Getting Away With It" was everything I'd hoped it would be - a perfectly crafted synthpop song with a sound that teeters between despair and jubilation, bolstered by Neil's backing vocals and a full orchestra conducted by Anne Dudley of Art Of Noise fame. And despite an 18-month wait for a follow-up, Electronic soon became one of my favourite acts. In Australia, however, the number 40 peak of this single was as good as it got. Our second and final new entry for the week is from an American producer/DJ who had worked with New Order in the mid '80s, as well as Hall & Oates, Bob Dylan and Freeez, among other artists. Arthur Baker also released his own music every once in a while, and in 1989 (yes, this was another release that took its time to translate to Australia), he teamed up with soul legend Al Green for this track from his Merge album. Like Al's last appearance on the ARIA chart - his duet with Annie Lennox on "Put A Little Love In Your Heart" - I found "The Message Is Love" a bit under-cooked. At a time when harder-sounding house and other forms of dance music were taking off, the production felt a bit light, which is possibly why the song didn't get any further than this entry position. Next week: a raucous future number 1 charges into the top 50, plus Craig McLachlan follows up his hit named after a girl with... another song named after a girl. Also, Boom Crash Opera and Margaret Urlich register new entries, and a stack of top 50 misses. 'Eye Know' and 'Put the Message In the Box' (missing the 'Put the...' from its title in some territories) seemed like they were bigger hits here than they were. The World Party singer looks like the proto Liam Gallagher in that video still. I remember reading about 'Elephant Stone' (surely one of the weirdest songtitles to dent the chart) in Number One, but didn't actually hear it until downloading it out of curiosity in 2012. It's probably my favourite Stone Roses song that I know. Quite ironic that Leila K would be rapping "ain't down with no crack" considering what would later become of her 'lifestyle'. I didn't know about the peeing incident, though! The delayed charting entries this week really illustrate how behind Australia still was with a lot of dance/rap music at the time. Though the 8-month delay for Electronic to dent the top 50 is still unexplained. Perhaps they held it off a bit longer once 'World In Motion' was on the schedule, not wanting 'Barney' overkill? I much prefer the second/US video we got (or at least aired in the rage top 50). ‘Getting Away With It’ deserved to be a much bigger hit. The Message is Love by Arthur Baker and Al Green was a big favourite at the time. Even better was the Cupid Mix of that track which was stripped down and had a rap added. I think that version of the song would be much more up your alley. It took me a few more years to appreciate Electronic. I liked Getting Away with It, but it was not a song that made me sit bolt upright to pay real attention. The album as a whole was really good, but their song Disappointed which came later was what really did it for me. The Electronic album is awesome - one of my top 30 albums of all time. I was nearly going to buy the reissued Electronic album last year for the bonus DVD (I think, or maybe it was a 'best of'), to get a decent copy of the second 'Getting Away With It' video, but then it aired on rage soon after so I didn't bother.